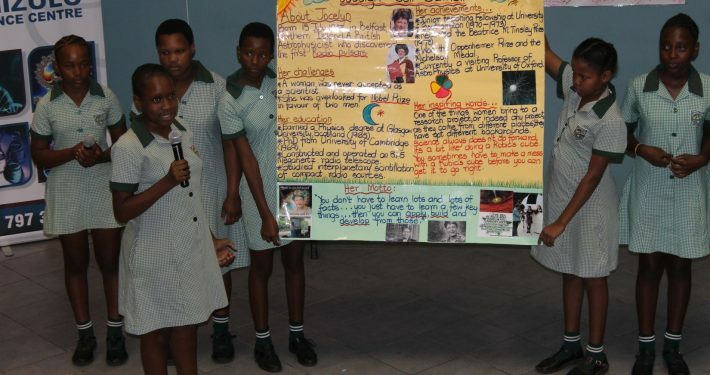 International Science Center & Science Museum Day | Girls of Tomorrow: A South African Success Story! 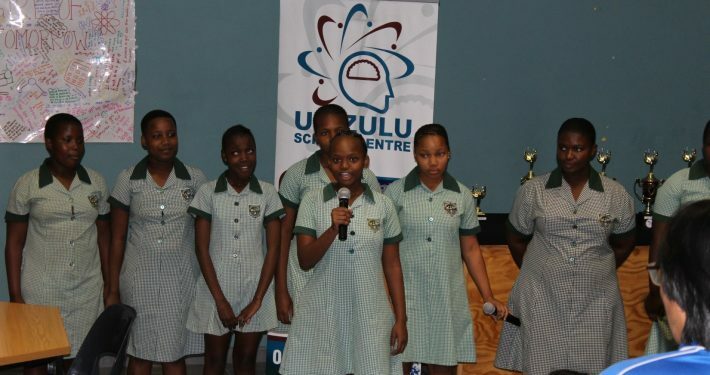 The Girls of Tomorrow program is a female empowerment and education initiative launched in late March 2016 by the University of Zululand Science Centre in Richards Bay, South Africa. 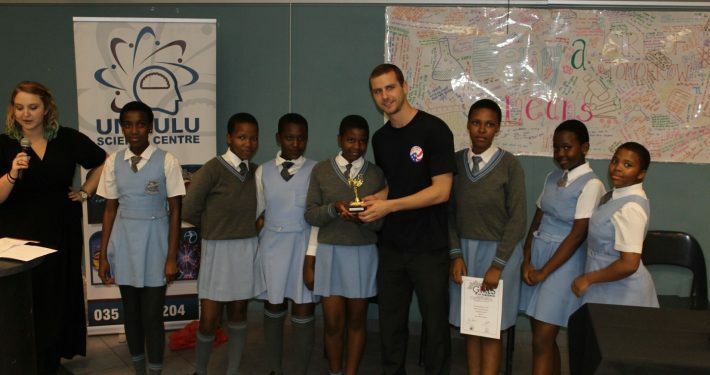 The Unizulu Science Centre, in collaboration with the U.S. Peace Corps and funded by Michelle Obama’s “Let Girls Learn” initiative, targeted girls from ages 12 to 14—before they enter High School and are exposed to the unfamiliar, often threatening, environments of various disadvantaged secondary schools in the area. The primary goal of Girls of Tomorrow is to empower girls through exposure to the studies leading to STEM fields, as well as exposure to women in STEM, both contemporary and historic. The Girls of Tomorrow program began with a series of school visits to three disadvantaged schools near the science center. During these visits, the Peace Corps and Japanese International Collaboration Agency (JICA) volunteers, along with Unizulu Science Centre staff and interns, engaged with the girls in the project through empowerment activities and science talks. We distributed Girls of Tomorrow booklets, which display the struggles and accomplishments of various females in STEM careers for the girls to use as role models. Throughout the course of a month, we coordinated with learners, teachers, and principals as the girls broke into groups and developed presentations on the females in STEM from their booklets. On April 26, all three schools joined us in a sponsored visit to Unizulu Science Centre where the day was dedicated to their activities. With six seasoned Peace Corps Volunteers from all over the region, we hosted gender workshops, teacher workshops, empowerment activities, and role model and educational talks. The girls also had the opportunity to meet and speak with some local female scientists. They practiced their presentations and prepared for their next sponsored visit to the science center, where they would present to an auditorium full of special guests and scientists. May 9 was the big day, and the girls were ecstatic. Guests arrived from as far as the U.S. and India and from a broad range of fields within the STEM disciplines. The day opened with powerful and earnest remarks from the U.S. Consul-General in Durban, the Department of Science and Technology, Unizulu Science Centre’s director, Derek Fish, and other notable speakers. Following those encouraging speeches, the girls presented posters they’d developed on the females they’d been studying and had some time to connect with our guests. They then presented the projects they’d been working on. They took the forms of dramas, poems, songs, or formal presentations, and… wow… they were phenomenal. The girls made everyone proud, and it was clear they were just as proud of themselves. In the end, the project was a tremendous success. Teachers pleaded that we repeat the program with the other grades in their schools, and the guests were educated about the severity of the hardships these young girls are facing in our schools. But most importantly, the girls gained an experience that will stick with them through their studies and possibly motivate them to persevere through the male-dominated courses that can give them a better understanding of their world and a better shot at a promising career. These girls left the project proudly identifying themselves as the Girls of Tomorrow, and we are confident that’s who they’ll be! We plan to continue the Girls of Tomorrow program in perpetuity so long as we can continue to secure funding, and would love to expand the program! For more information or access to more photos, videos, and materials please contact Derek Fish on thefish@iafrica.com.